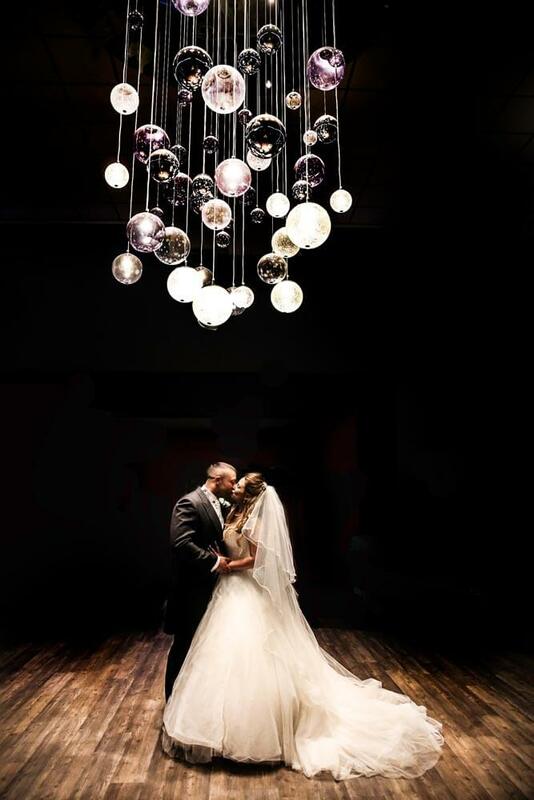 If you’ve never seen the incredible ‘chandelier’ in Greens at Gretna hotel atrium, you probably won’t understand its appeal; but let us show you why it makes such a wonderful photo with the image below! 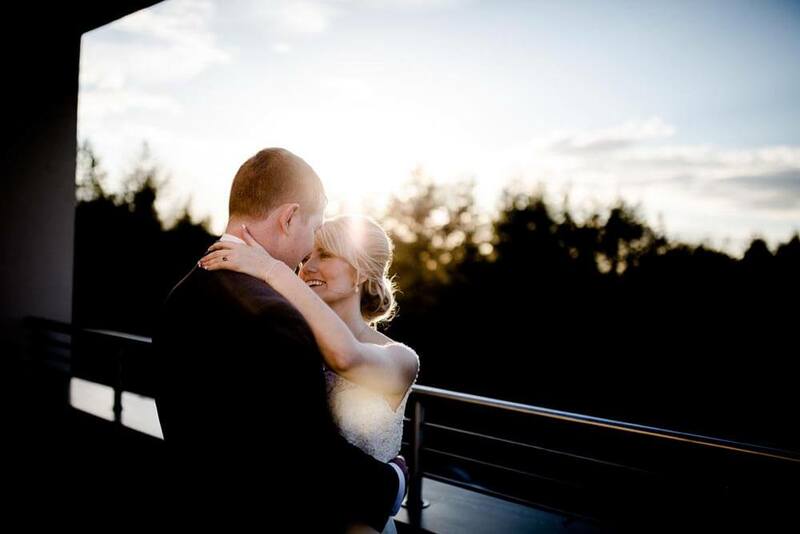 Exclusive to couples marrying or staying in the Penthouse at Smiths, having your photo taken before and after your wedding on the balcony of the Penthouse is always a lovely photo to keep. 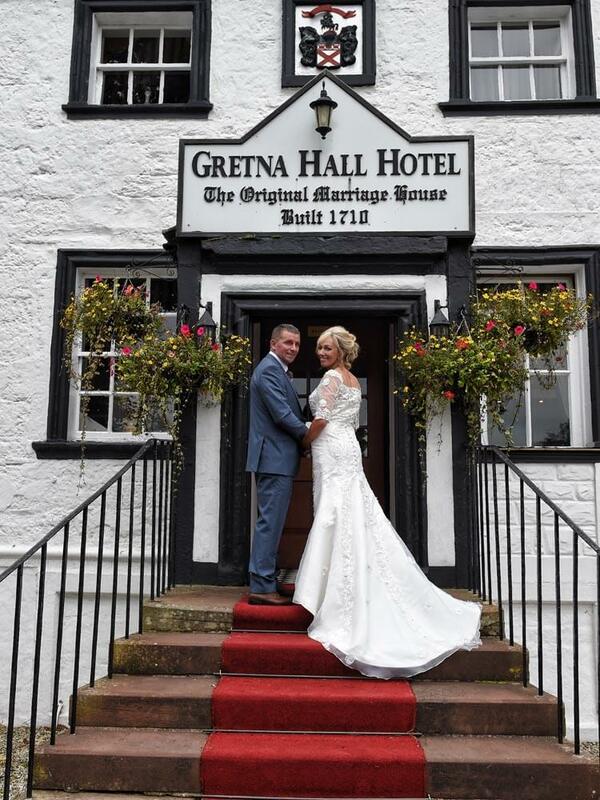 A some-what traditional pose, many couples still choose to have their photos taken on the red-carpet steps of Gretna Hall Hotel, with its traditional sign above the door! Our favourite Gretna Hall steps photos have been family and group shots, with guests cascading the steps and the couple above like the top of a wedding cake! The Rennison Room is titled for its namesake Richard Rennison, the last Anvil Preist in Gretna Green, who retired in 1940 when the laws regarding the legitimacy of this Scottish marriage tradition were repealed. This room is our most intimate wedding venue and is a favourite with couples travelling to Gretna Green to marry alone and couples looking to take pictures signing the registry. 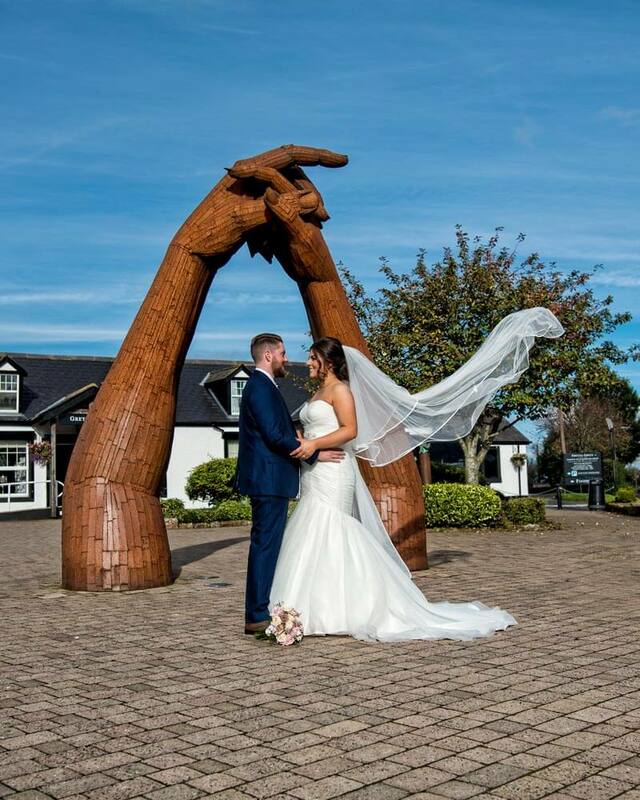 We say… don’t miss the chance to capture this iconic Gretna Green shot! The Coach Museum, located in the Famous Blacksmiths Shop, exhibits a fantastic collection of Scottish travel memorabilia, including horse-drawn coaches and carriages, bicycles, and farming machinery too! 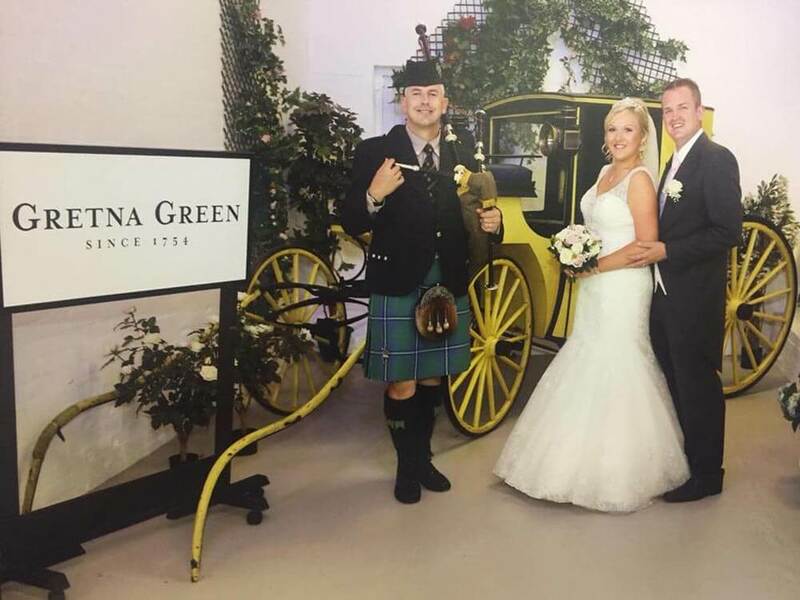 Posing in front of the beautifully preserved ‘Yellow’ coach and the Gretna Green Since 1754 sign is a must-do when you marry in Gretna Green. If you choose to have a piper at your wedding, he will also join you for pictures in the coach museum! A great memory from the day! Built in 1830, for the purpose its name suggests, the Old Toll Bar is the first and last house in Scotland and stands proudly at the entrance (and consequentially exit) to Gretna village. 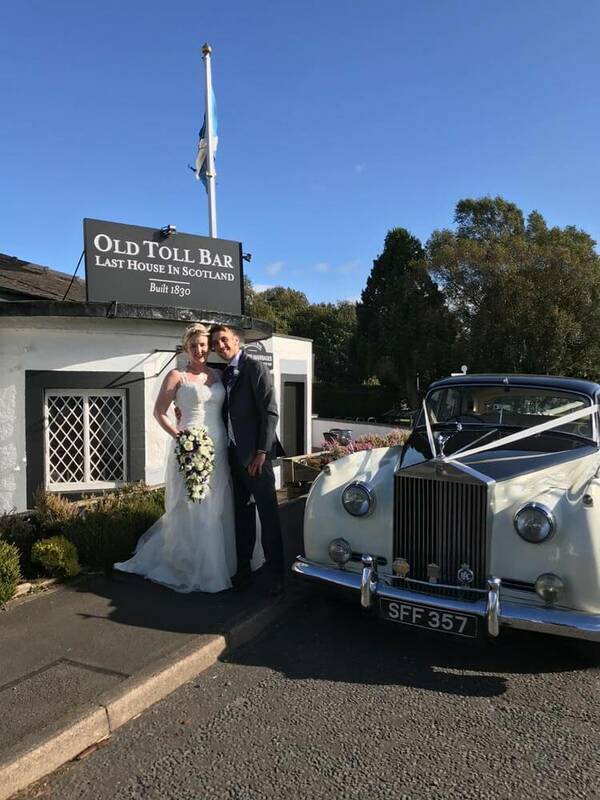 With over 10,000 marriages performed in this small historic building, it is a truly romantic setting and having your photograph taken in front of the white and black exterior with the Scotland flag blowing in the wind, (we think) makes for a fantastic photograph! Our 4-star boutique hotel, Smiths at Gretna Green, has some beautiful gated gardens which sit outside our function rooms. Posing outside of the woven gates is a popular photo stop for both couples and family and group shots! We recommend standing to face the sun, to capture these shots in the best possible light! While some couples are content with the interiors of the Famous Blacksmiths Shop, many others also want to capture their love in front of the historic building's exterior too! 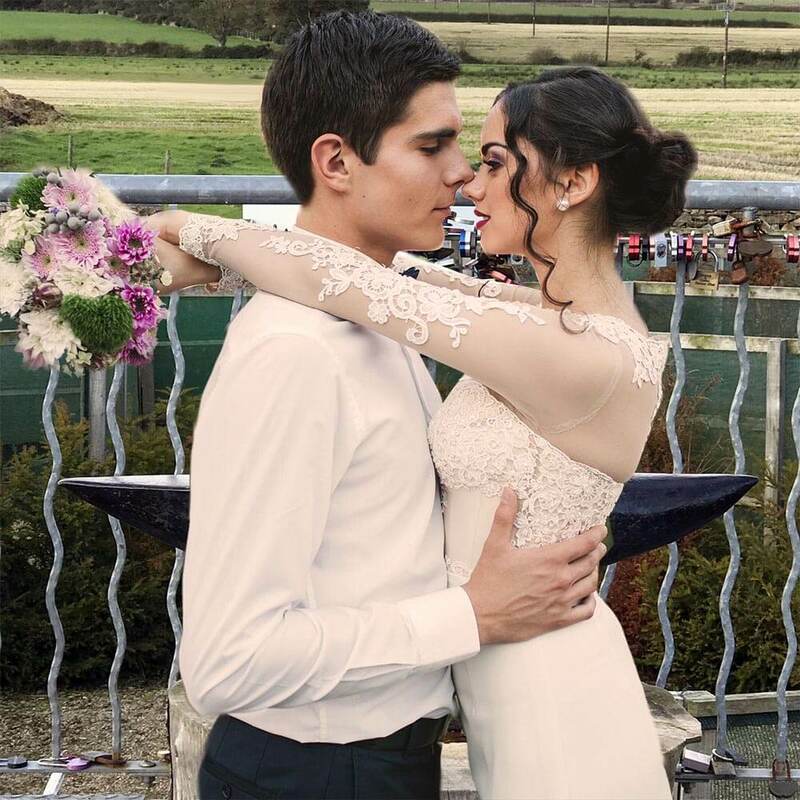 We love the juxtaposition of new love in front of old love in these photographs! The Gretna Hall gardens, surrounding the 18th-century former manor house are part of the 10 acres of land circumventing the hotel. Couples love posing under the pergola, next to the ancient anvil and in front of the ‘Kissing Gate’ too. Throughout the year, the Gretna Hall gardens, change with the colours of the season, but remain a beautiful place to capture your day! The first and last hotel in Scotland, Greens at Gretna sits at the very edge of Gretna Village, just a stone’s throw from the border and directly opposite the historic Old Toll Bar. Its gardens, designed several years ago and originally exhibited at a UK flower show, are based around a heart-shaped pond and inspired by the gardens and plants of Japan! 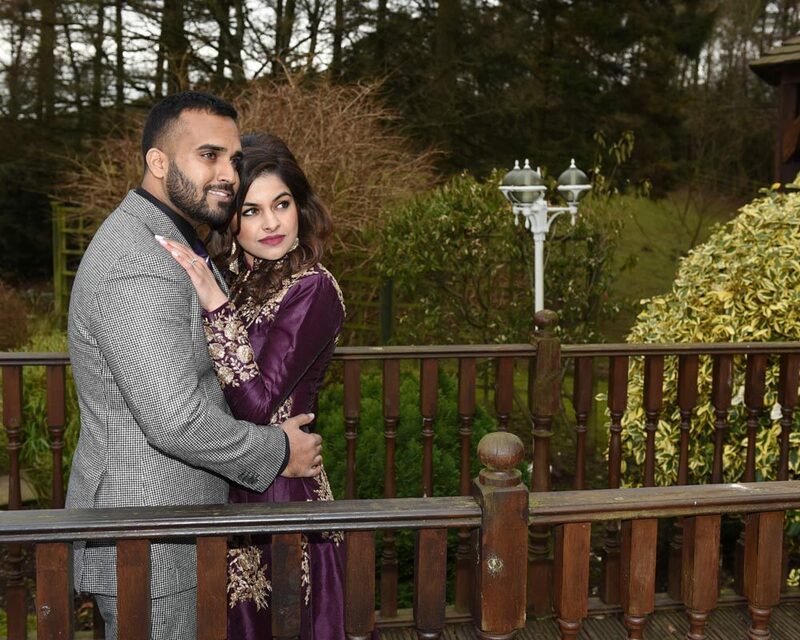 An extremely popular outdoor wedding venue, it is also a wonderful place to pose for various photographs, including under the pergola in front of the Anvil, on the red bridge or in front of the fountain. 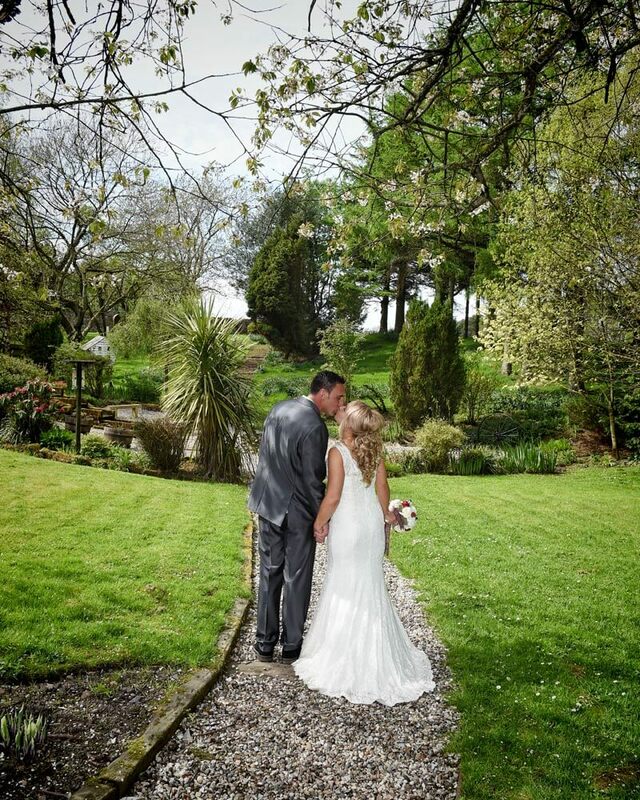 We recommend that you call ahead to ensure availability if you are not marrying in the gardens themselves so that you don’t bump into a wedding couple! As the name suggests, the Coach House at Gretna Hall once housed visiting coaches for guests joining the family at the Gretna Estate Manor House and in its later life the hotel. Now, it is home to only one, beautifully restored and preserved coach and is one of Gretna Hall’s most popular historic wedding venues. Recently refurbished to now include rows of pews for guests attending the ceremony, posing in front of the vintage coach is fast-becoming a favourite for Gretna Green wedding photographs. 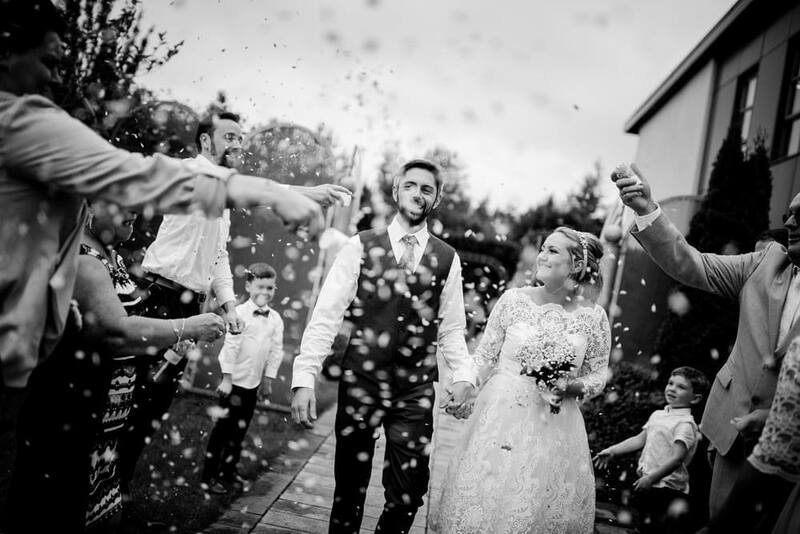 Please make sure you arrange ahead of time if you are not marrying in the coach house, as you will need permission to access the coach house; subject to availability. Commissioned especially for the Famous Blacksmiths Shop courtyard, to add to the late Adair Houston’s incredible sculpture collection, the joined hands are probably the the most popular photo point for visitors to the Blacksmiths Shop attraction, just behind the Kissing Arch. For couples, the best photographs here are most definitely by night, as the hands are lit from below by white lights creating the most spectacular ambience for the perfect romantic photo! They are also a great spot for fun family photos! We have seen more than a few children captured under the hands, over the years and we never tire of seeing it either. A relatively new stop on the Gretna Green Wedding Photo tour, the bridge located in the centre of the Courtship Maze (which from the sky is actually two interlocking wedding rings), offers a fabulous opportunity for unique photos amongst the LoveLocks, in front of the ancient anvil, overlooking the fields beyond! We recommend the bridge for the perfect picture at sunset! Inside the maze, there are also some hidden seats, which make great places for seated wedding photographs too! 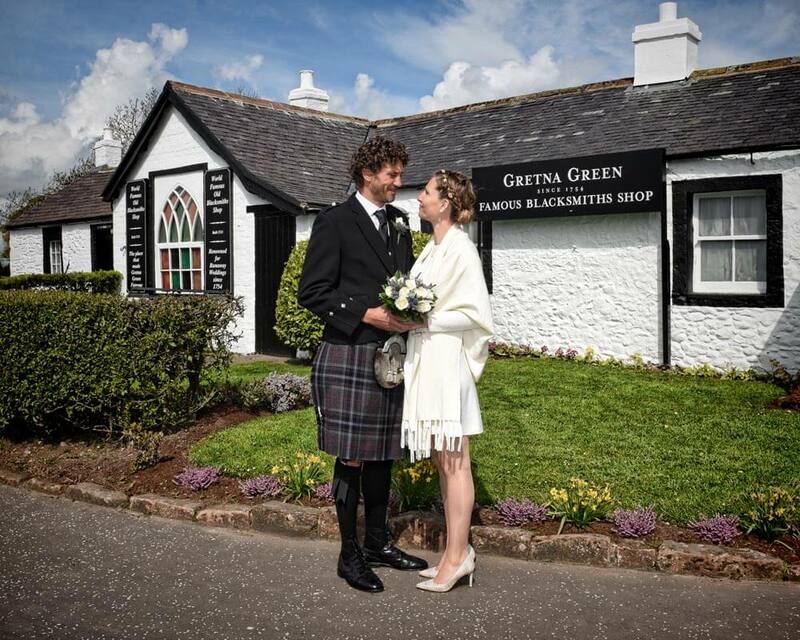 If you have heard of Gretna Green, then you will know that our place name is as famous as our history its self. 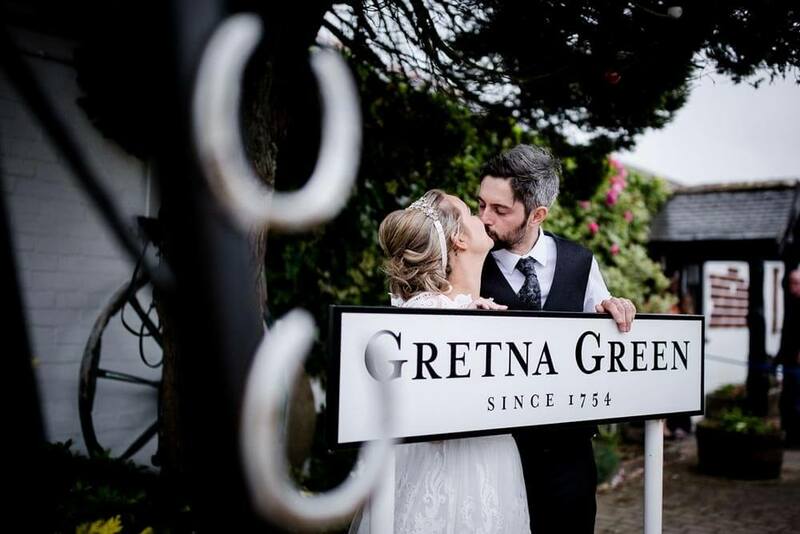 Which is why posing in front of and behind the Gretna Green Since 1754 sign and under our Kissing Gate are two of the most sought-after wedding shots in Gretna Green. 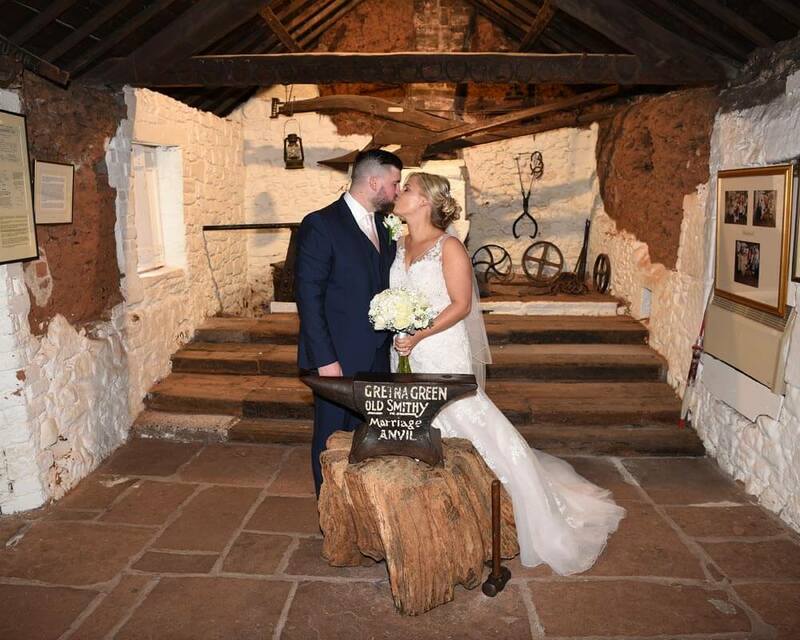 If you marry in the Famous Blacksmiths Shop, then the kissing gate and sign are a core pose, but even if you don’t we still recommend you come and capture this iconic shot, if only for the keepsake! 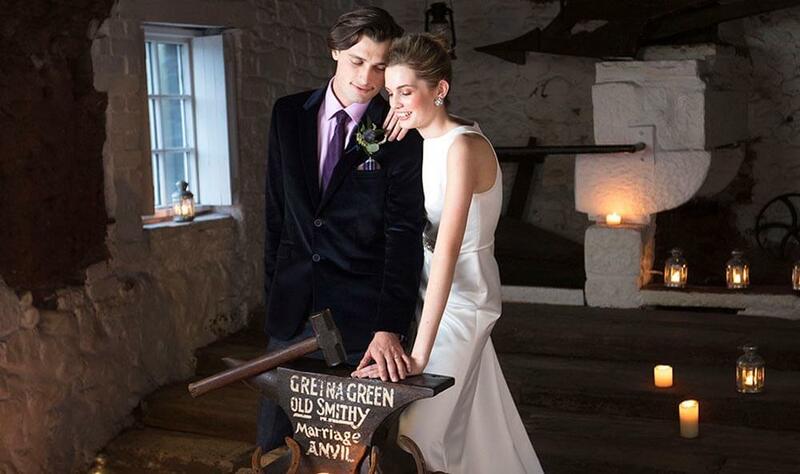 As you can imagine, the number one, most popular wedding photograph for a Gretna Green couple, is behind the world-famous Anvil, in the room where Anvil weddings first began, back in 1754. The old stone floors and walls and that historic black door holds the romance and excitement of the couple’s centuries before you. 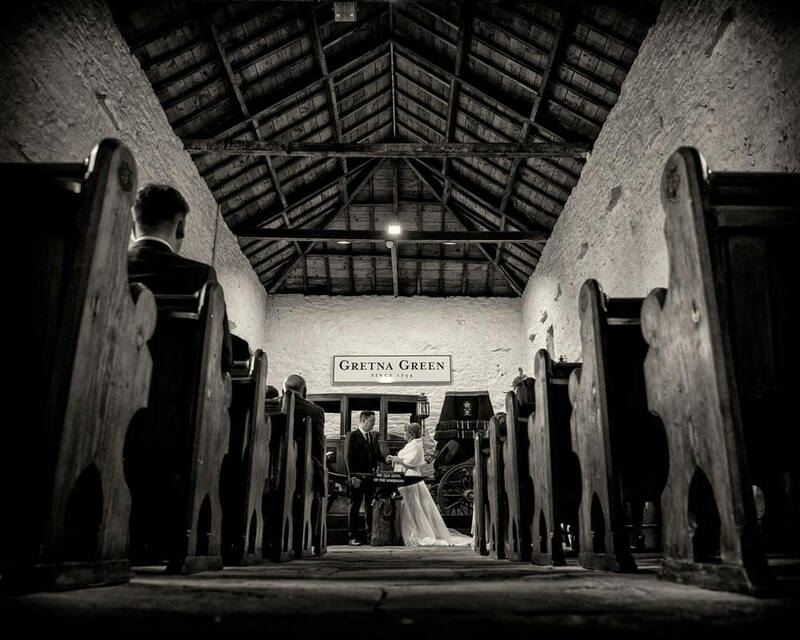 A truly electric room and the best keepsake of a Gretna Green wedding that you will take home… other than your newly wedded spouse of course! 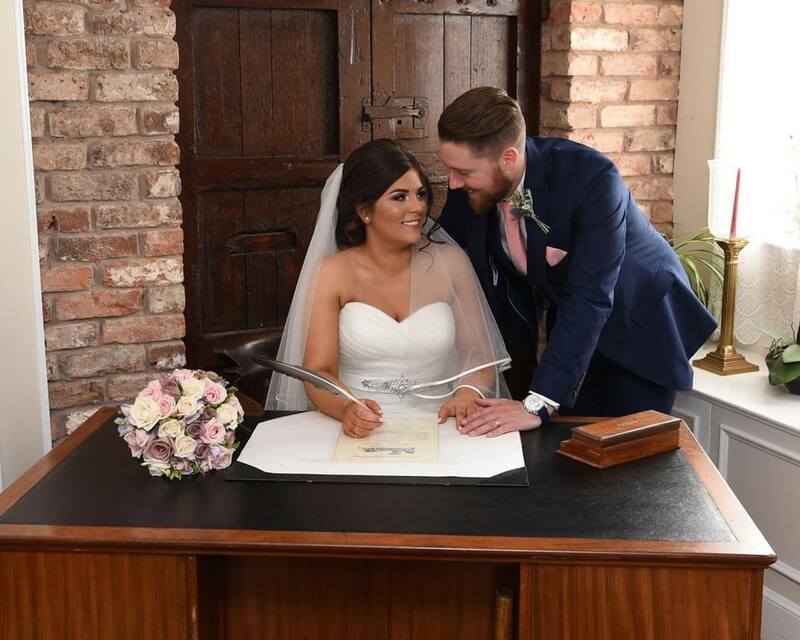 If you are marrying in one of our other venues, but would still like to have your photo taken in the original marriage room, please just give us a call and we will do our best to accommodate you! There are many more incredible shots to be found in Gretna Green and Gretna… in the fields outside Smiths, even in the road! We’ve seen many stunning and unique compositions over the years, but we would love to see more of your unique ways to capture your wedding! 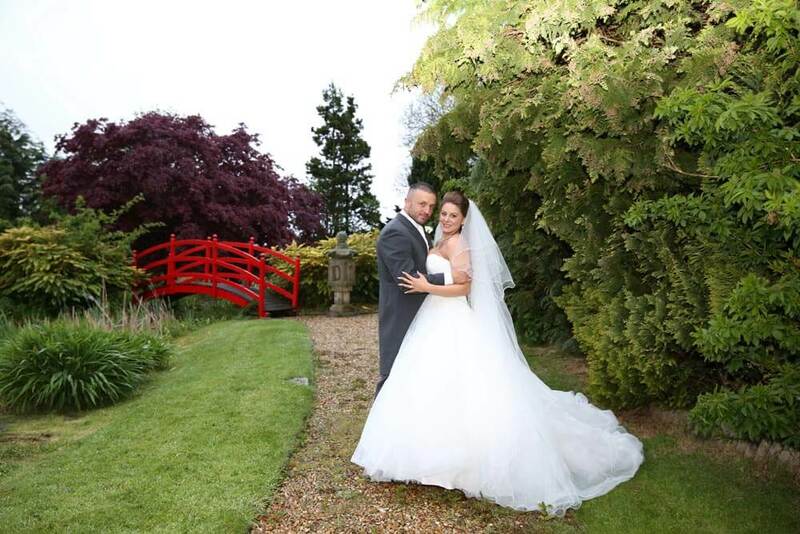 We love seeing all of our couples wedding photos, past and present, so please make sure you share them with us! Follow us on social media to take part in #weddingwall Wednesdays where your photo could be shared with everyone next week! 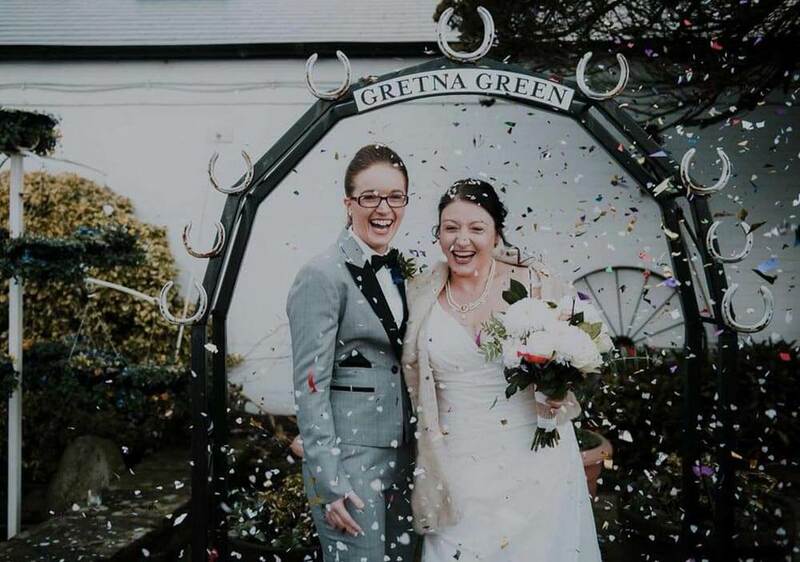 If you would like to discuss getting married at Gretna Green or Gretna, in any of our venues, you can talk with our experienced Wedding Planners, on +44 1461 336001 or by emailing weddings@gretnagreen.com or why not Request a Brochure to see all that we have to offer!